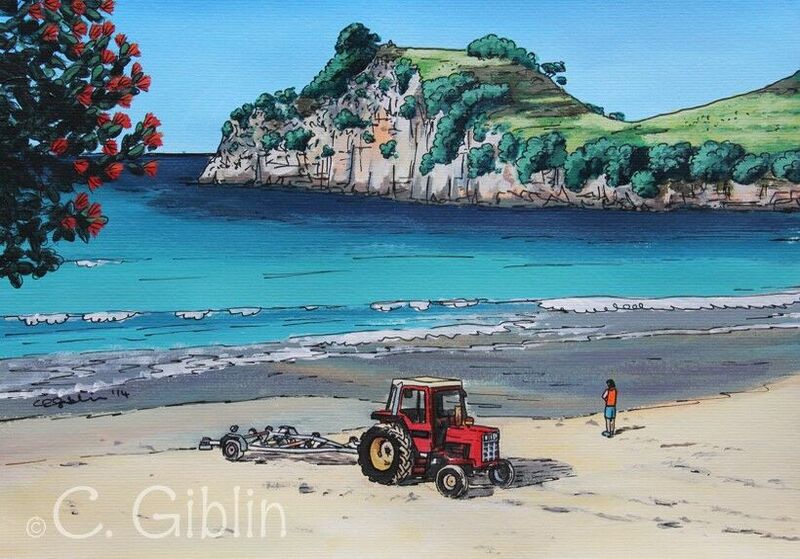 The Coromandel’s a far cry from Cardiff, where Whitianga-based artist Charlotte Giblin spent most of her adult life. A one year foundation course formed the basis of her artistic journey. She gained a BA(hons) in Ceramics at the University of Wales Institute in Cardiff and then established her own pottery business, hand-throwing over 25,000 mugs, plates and bowls during 10 years in business. She met her Kiwi partner Pete in the UK and in 2009 they packed up their suitcases and booked a one way flight down-under. Living in New Zealand, and particularly the Coromandel has given Charlotte space, inspiration and a new colour palette to work with. Charlotte’s been painting full time since May 2014, when she stepped down from her role as Mercury Bay Art Escape Administrator to commit fully to making her own art. Moving to Whitianga to take up the role was a positive experience, allowing Charlotte to get to know local artists, find her voice and provide a platform from which to grow as an emerging artist. Before moving to Whitianga, she held the inaugural post of Gallery Director at Wallace Gallery in Morrinsville. It was a high profile role where she curated a successful exhibition programme for the new gallery, as well as cementing a close working relationship with the Wallace Arts Trust in Auckland. Whitianga provided Charlotte with the breathing space to do something she really loved; initially working part-time for the Art Escape and eventually moving into painting full-time. By her own admission, she’s extremely prolific. Her Big Skies illustrative series were the first paintings she produced after moving to Whitianga. They are a collection of 120 "diary entry" paintings which chronicle her adventures in the Coromandel over three years. From the collection, she produced a book titled Wandering Under Big Skies, which is a favourite with overseas tourists and local accommodation providers, who like to display it as a coffee table book for visitors. Charlotte’s Big Skies series led to commissions for local-themed paintings and large-scale murals featured outside Blue Water Marine Services and the Mercury Bay Rugby & Sports Club, and in St.Andrews Shopping Village in Hamilton. Private painting commissions have included iconic Coromandel scenes featuring the Golden Shore Mussel Barge, boats and tractors at Whitianga Wharf and the Lost Spring. Charlotte says the commissions and murals gave her the confidence to go on to do her own thing. “You just have to trust and do what you feel is right,” she says. What felt right was a series of striking self-portraits, called Emerging, propelling her into her new existence, out from arts administration and into full time artist. Her ‘Emerging in Full Colour’ portrait was 1 of 59 chosen as an Adam Portraiture Award Finalist. “Being part of that as a first time portrait artist was enormous. I’m known for my illustrative work, so it was quite a shock to people that I could paint.” The Emerging series caused a positive stir, especially among women who could relate to the powerfully confronting images. ‘Stop looking at the gate!’ initiated Charlotte’s most recent series; the Forests and Fields. Of course, naming a painting ‘Stop looking at the gate’ instantly makes the viewer look for the gate, and that is the essence of the painting. She explains: “I’m always looking for the next thing on the horizon and in doing so, miss what’s around me in the current moment.” The painting gave her pause, and from that point her work changed, becoming bold and large scale, documenting an almost fairy-tale narrative of journeying through dense forest, eventually arriving at a new destination. Removing her specs forced Charlotte to loosen up in a way where she wasn’t controlling the work, and using a palette knife to paint with further transformed the process. Visit http://www.charlottegiblin.com for details about Charlotte’s upcoming workshops. Charlotte’s first solo exhibition runs from Sept 30 - Oct 13 at Whitianga’s Bread and Butter Gallery. It's called 'As the Path Unfolds' and is the next chapter in Charlotte’s Forest series.